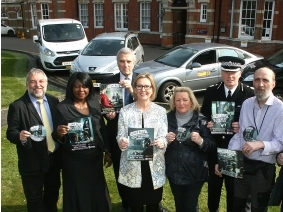 A countywide initiative to raise awareness of child sexual exploitation (CSE) has been launched in Southend-on-Sea and across the county. Southend, Essex and Thurrock Safeguarding Children Boards in partnership with Essex Police launched the I Didn’t Know campaign with an aim to break down some of the myths around CSE and encourage members of the public to report any concerns they may have. Local businesses are particularly important in tackling CSE and as part of the campaign local taxi drivers are getting involved by displaying awareness stickers in their vehicles (picture below). The stickers were paid for by the Police and Crime Commissioner's Hidden Harm fund. The campaign demonstrates that tackling CSE is a whole community effort; whether you are a parent, member of the public or business owner there are things you can do to help stop this horrific crime. The concept for the campaign has been inspired by a project designed and created by the Essex Children in Care Council (https://www.youtube.com/watch?v=qQDYpIpgdtA.) It aims to raise awareness about Child Sexual Exploitation across the wider Essex area and support communities understanding of CSE, how to recognise it, and what to do to get help and support. The campaign will be running locally with each district in Essex supporting the campaign in their communities. Everyone is able to access the resources to download and print via the Essex Police www.essex.police.uk./cse or LSCB websites and business owners in particular are encouraged to become involved as research has shown some of the locations in which young people are being groomed by perpetrators include cafes, taxi ranks, shopping centres and fast food outlets. You can support the campaign on social media #KnowAboutCSE, visit essex.police.uk/cse to download resources and watch videos or join the live web chat where you can ask your questions about CSE to members of Essex Police and Essex County Council.